Arthur Karl Greiser (born 22nd January 1897 in Środa Wielkopolska, died 21st July 1946), Reich Lieutenant and Poznań Gauleiter in21 July 1939-1946. 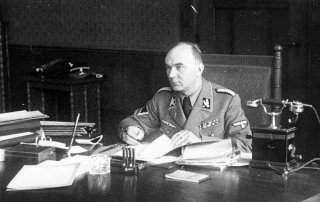 Chief realiser of Nazi policy in occupied Wielkopolska and part of the Łódź land incorporated into Warthegau. After being released from hospital, he remained jobless and then tried his luck in trade, with no success. He did some irregular jobs; in the summers he showed tourists around Gdańsk using a rented motorboat, and in winter he towed ships in Gdańsk harbour. He joined the NSDAP in 1929. He was a good orator, which gained him a lot of popularity in the party. In 1934 he became president of the Gdańsk senate i.e. head of the Free City of Gdańsk. Once the war broke out in 1939, he wanted to enrol in the navy. Adolf Hitler, however, made him Reich Lieutenant in Poznań and endowed him with absolute power over Warthegau. “No prince and no king enjoyed such a power”, said Greiger in a speech to his compatriots on 5th November 1939 in Środa Wielkopolska, his home town. It was there where he laid out the most important points in his extermination programme for Polish people. The next day in Poznań he explained it in more detail in a speech inaugurating his office. The conditions Greiser created for Polish people in Warthegau translated into repression and restrictions more severe than those that Poles suffered in the General Government. Poles performed slave labour, almost all the churches were closed, food was limited to mere subsistence portions. Greiser wanted to totally Germanise Wielkopolska, which was to become an integral part of the Third Reich. This goal was supposed to be achieved using a combination of methods: – physical extermination, mostly of the broadly understood elites; deportations of a significant part of the population to the General Government to make space for the Germans who came to Warthegau from various areas in Europe, mostly from regions under Soviet control; searching for “German blood”, i.e. entering people on the Volkslist; deportations for labour in the Reich. But for the population policy, the most important, burning issue was to “de-Jew” Warthegau. Wielkopolska Jews were first transported to the General Government (together with hundreds of thousands of ethnically Polish inhabitants of Wielkopolska). The authorities of the General Government protested many times against deporting Jews from Warthegau, as this gave rise to too many organisational problems for them. Therefore, deportations were suspended and Wielkopolska Jews were put into labour camps, of which there were several dozen in Warthegau, and into ghettos. The largest ghetto was created in Łódź. Greiser, in an agreement with Heinrich Himmler, opened an extermination camp for Jews in Chełmno upon Ner in December 1941. One in every hundred Wielkopolska Jews survived. Arthur Greiser married (for the second time) to Maria Koerfer, a pianist. His ambition was to make Poznań the cultural capital of the German East. Warthegau was intended to become a Mustergau i.e. a universal model for others to follow. In 1945 he was arrested by the American army and handed over to the Poles. Arthur Greiser was hanged on 21 July 1946. The sentence was carried out in public in the Poznań Citadel. This was the last public execution in Poland.